Black mob on rampage fractures cop’s skull | What Did You Say? (Editor’s note: Colin Flaherty has done more reporting than any other journalist on what appears to be a nationwide trend of skyrocketing black-on-white crime, violence and abuse. WND features these reports to counterbalance the virtual blackout by the rest of the media due to their concerns that reporting such incidents would be inflammatory or even racist. WND considers it racist not to report racial abuse solely because of the skin color of the perpetrators or victims.) Videos linked or embedded may contain foul language and violence. 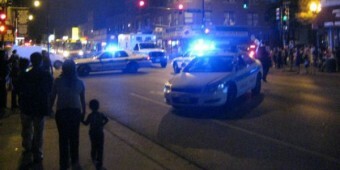 A Chicago police officer is hospitalized in serious condition with a fractured skull, a victim of black mob violence. The as-of-yet unidentified officer was responding to a call early Saturday morning when he found dozens of people in the street, creating mayhem. He immediately called for backup, but instead of waiting for reinforcements, went to the assistance of a woman under attack. The mob turned on him: He was struck on the head with the bat. What the stories do not report is more important, say two Chicago police officers: The crowd was black, missing from all the news reports. If the police on the beat are restrained from talking about the incident in public, the police blog Second City Cop is not. Some of the violence against police is on video, as were the black mob attacks on police that followed a police shooting last year. Two officers were chasing a car of five suspected truck hijackers when they crashed. Four got away. One remained and was fighting with one officer, then advancing on another when he was shot and killed. Soon after, a crowd gathered, with several people saying the black man was shot for no reason and the cops were killers. The mob grew to the hundreds, and soon they were yelling profanities at the police, complaining of police brutality. They also threw “bottles, bricks and rocks,” said the Chicago Tribune. Jamal Moore, the dead man, had a long history of trouble with the law, including a 2006 arrest and conviction for armed robbery. Several days after the riot, Revolution News reported that a flyer urging more violent action against the police was distributed in Chicago neighborhoods. People were shouting, “We’re tired of this. We’re tired of them shooting down our kids,” and, “F— the police!” In the face of the guns and clubs, the people defiantly fought back. Despite the dozens of cell phone cameras capturing the action, not one captured a recording of police using racial epithets. Nevertheless, Revolution News said Moore was really a victim, not the violent predator police would have us believe he is. The officers say people who depend on local TV and newspapers are largely ignorant of the violence and racial slurs directed at white police officers on a regular basis. The summit, broadcast nationwide on CSPAN, featured little talk about violence and lots of talk about racism and how unemployment are the real problems.